We know that what you need most from a tractor GPS system is simple, clear guidance. 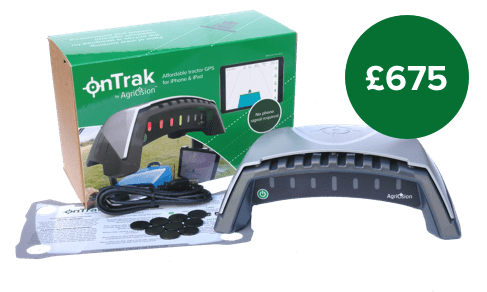 The focus is very much on the basics plus a few useful additional features included with onTrak. onTrak ensures you cover the area with minimal skips and overlaps. With onTrak there are no constraints. The system is equally at home on an RTV or a 200 hp tractor. The onTrak device requires no wires or installation. 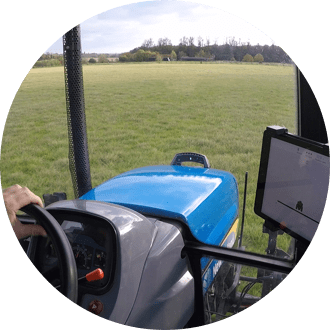 Simply place the system on any machine and harness the potential of GPS guidance. Never before has it been so easy to equip any vehicle with precision guidance. The majority of farmers own a powerful smartphone or tablet already. Utilising this with onTrak means you don’t need to buy an additional expensive screen. The majority of farmers own a powerful smartphone or tablet already. Utilising this in onTrak means we don’t need to supply you with an expensive additional screen. onTrak’s built-in GPS, GLONASS & GALILEO + WAAS & EGNOS receiver (10Hz) normally results in pass-to-pass accuracy of 20–30cm. The field of view, externally mounted light bar gives the user a unique experience with reduced fatigue and more accurate driving. onTrak is equally at home on an RTV or a 200 hp tractor. With its Patent Pending design, onTrak needs no wires or complicated installation. AB Guidance Lines are virtual tramlines that onTrak creates to guide you accurately. Save your AB lines and field boundaries for the next time you visit the field. No need to recreate them again. For side mowing or recording spray placement. Implement Offsets allow you to accurately setup onTrak to match your machine. By driving around the boundary of the field you can measure the area. Very useful for contractors visiting new farms. With onTrak there are several ways to share data. Take a simple screenshot and email to your boss or use onTrak.Cloud to sync .kml data. Map exactly where your implement has worked for minimum overlap or skipped areas. Particularly helpful for spraying and fertiliser application. At the top of your field list will be the fields closest to you, saving you time. Adjust the guidance sensitivity easily with a simple slider. As you become more experienced you can turn it up. View worked area and field boundaries on a satellite image overlay. For simple sharing or record keeping take a screenshot. Does onTrak work with Android phones? onTrak is only compatible with Apple devices. Many customers have purchased a second hand iPhone or iPad to operate the system. An Android version is in development for release in the future. Sign up here to get notified when the Android app is available. How do I connect onTrak to my iPhone/ iPad? The device connects over Bluetooth so no annoying wires! When the device is on and the onTrak application is open the Bluetooth will connect automatically. Will I need a data connection on my iPhone / iPad? No – For normal field use an internet is not required. If you wish to use the satellite overlay feature or sync with onTrak.Cloud then an internet connection will be needed. Otherwise the onTrak app only requires an Internet connection to install periodic updates. The onTrak Pass-to-Pass accuracy is industry standard 20-30cm. onTrak contains a high quality GPS module, which takes advantage of all the freely available correction systems, including EGNOS and WASS. Should the GPS receiver not be on the roof? Our testing shows that there is no negative effect of placing the receiver on the bonnet instead of the roof. In fact mounting nearer to the front wheels actually makes the guidance more responsive. 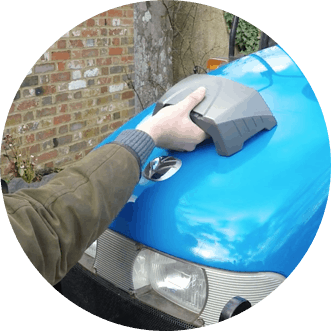 What if my machine doesn’t have a metal bonnet? We supply two sets of special mounting disks. These 3M sticky backed disks are made of magnetic material which forms a very strong connection with the magnets on the onTrak device. Most modern tractors have a metal area somewhere on the bonnet. Yes, as long as the USB cover is in place, onTrak is completely water and dust proof. 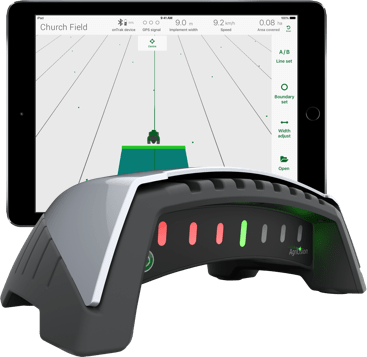 Can I charge the onTrak device while in use? Yes. With 24 hour battery life it’s unlikely you will need to charge in use. If for some reason you run out of juice you can charge the device while in use. Please remember that the device is not waterproof with the USB cover open. Is onTrak eligible for The Countryside Productivity Scheme (England) or Rural Development Program (Wales)? Yes – the onTrak goes above and beyond the minimum requirements of these grant schemes.